We are pleased to announce a gorgeous litter of 10 Sheepadoodles born April 8th. Based on their Sheepadoodle dad and Poodle mom, we expect this litter of puppies to be 50-65 pounds full grown. These pups are playful and a joy to watch. We believe they will make outstanding family members for a few fortunate forever homes. These are f1b Sheepadoodles. This is our first time to have apricot and white puppies, which comes from the Poodle mom's side. Although she is black and white, she has apricot and white in her background. We think this is a gorgeous litter. 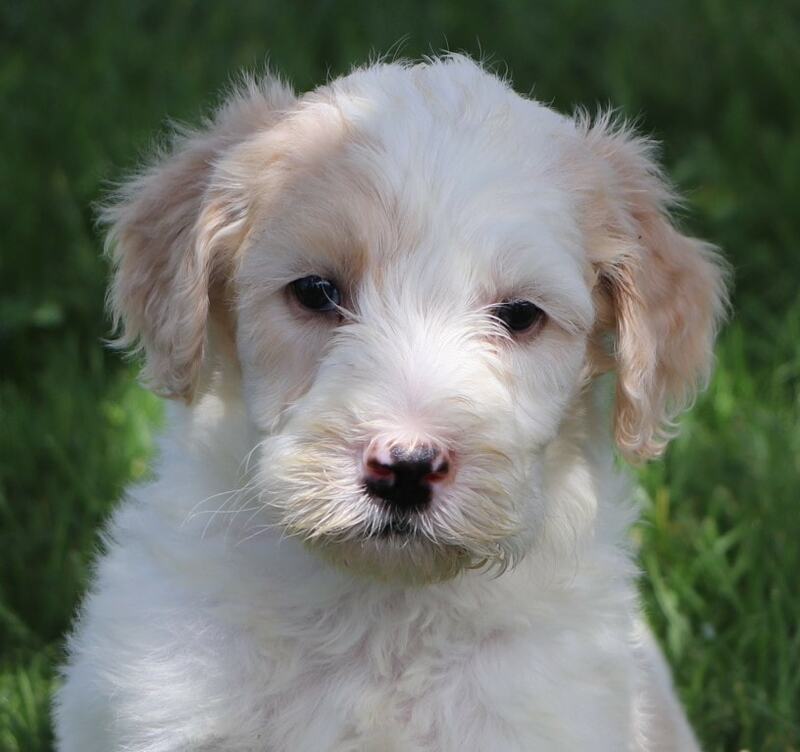 We charge $2500 for the red and white Sheepadoodles, because they are so rare, because the apricot and white pups in this litter are not dark enough to consider them red and white, we have priced them the same as our normal black and white Sheepadoodle pups. Lana is a lovely female Sheepadoodle with a gorgeous wavy coat. Lana is perky, affectionate, curious, and playful. She will make a wonderful furry family member! Leia is a gorgeous female Sheepadoodle with a beautiful black and white coat. Leia is spunky, confident and fearless with a sweet, cuddly side. She will be a great addition to any family! Lexi is a gorgeous female Sheepadoodle with a mainly white, wavy coat. Lexi loves to explore and is always finding new things! Lola is a beautiful female black and white Sheepadoodle with a curly coat. Lola is a quieter, laid back female but is still playful and really curious. Lily is a beautiful girl Sheepadoodle with a creamy, wavy/curly coat. Katie is a complete sweetheart, is very smart, and is very loyal. She has lots of energy and is a joy to be with! Lando is a male Sheepadoodle with a gorgeous black and white, wavy/curly coat. Lando is all boy; he's the first to do things, loves to explore, and greatly enjoys being the center of attention. Leo is a gorgeous male Sheepadoodle with a black and white, curly coat. He has a calm temperament and gentle disposition. He is a playful little boy who loves children. Levi is a cute male Sheepadoodle with a bi-color, curly coat. Levi is laid back, playful, and very cuddly! He will make a lucky family very happy. Luke is a cute Sheepadoodle that is super friendly. He loves to be with people, and nothing ever seems to get under his skin. Luke is super smart and very gentle, and we know that he will be very easy to train! Liam is a gorgeous Sheepadoodle with a curly/wavy coat and extensive white markings. He loves to show people his bright white chest, and he is affectionate and very gentle. We know that he will be a wonderful furry companion for any family or individual!